The purity of the climb is matched only by its unexpectedness. And no one has seen Jim Reynolds come. Yet this 25-year-old Californian made, on March 21, a solo among the most breathtaking of recent years. We are far from Alex Honnold’s solitary flights on the good and sunny rock of Yosemite. 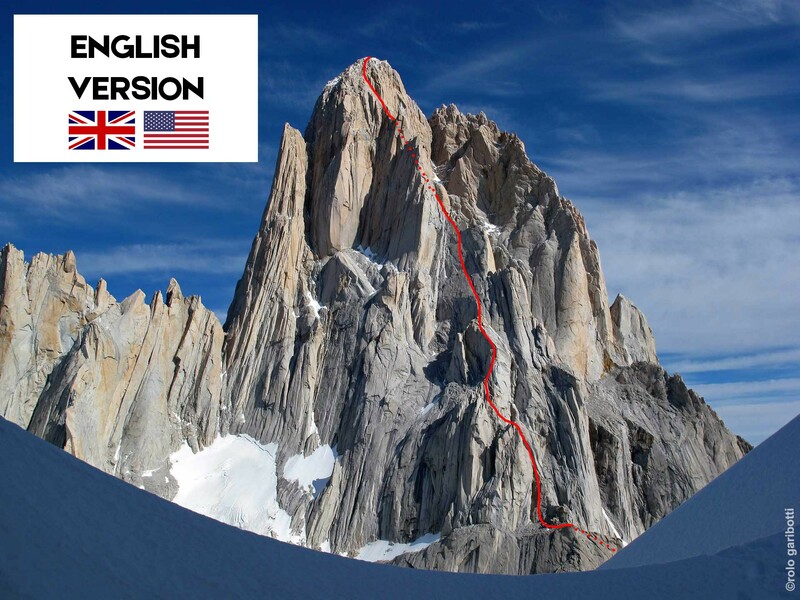 Reynolds has just climbed the Afanassieff route at Fitz Roy (1,550 m, 30 °, 6a +, Argentina), avoiding ice falls and playing with the bad Patagonian weather. But the real feat is elsewhere, because Reynolds has also downclimbed by the same way, without using rope. 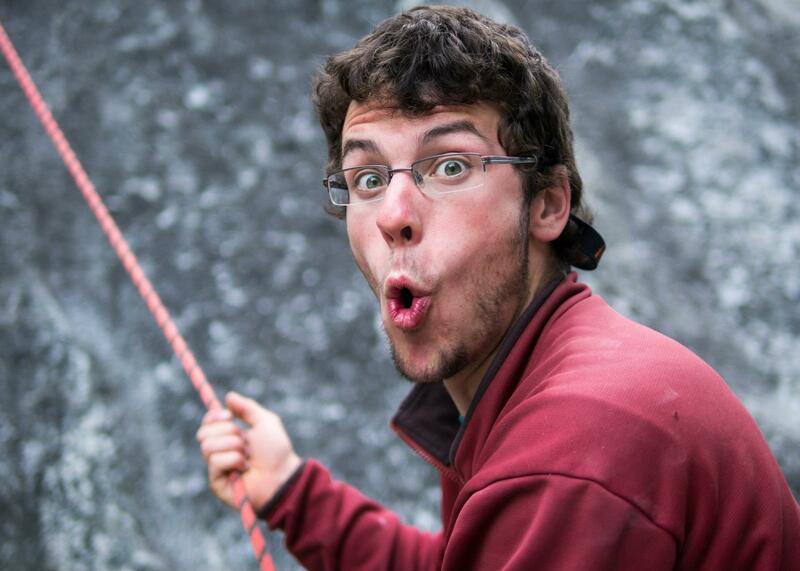 Exclusive interview with an inspired climber. Even if we know the American climbing community, especially in Yosemite, we must admit that we had never heard of Jim Reynolds. Or maybe yes, once, furtively, when this young Californian get for a short time the record of climbing the Nose (El Capitan, Yosemite) with Brad Gobright, during just over six months, in 2017 (2h19mn44s) . It was not counting on the crazy year 2018 that followed and successive records, with minutes shot, by the two masters of the place : Tommy Caldwell and Alex Honnold. Since then, it must be believed that Reynolds had resumed a discreet life, punctuated by relief to Yosemite, when, during the summer, Jim joined the team of Yosemite search and rescue. At only 25 years old, one can feel a bit of casualness in this guy who walks in Patagonia for the first time. And for good reason : his topo, he misplaced it, his helmet, he did not take him and his harness, he simply forgot it. So when he finds himself alone in the Afanassieff route at Fitz Roy, Reynolds does not tremble and assumes a « disconnected » vision of material contingencies, preferring to focus on the beauty of the place and technical mastery. Yet, we remember the solo of Dean Potter in the Supercanaletta, in 2002. But the base-jumper went down using rappels. Reynolds pursues an ideal of purity. To descend, he down climbed the same route. Following the precepts of Paul Preuss, pioneer and solo theorist in the late 19th century in the Italian Dolomites, Reynolds climbs a route that he is able to down climb. In the end, the American spent 6:38h to the climb and a little less than 9h on the descent. One of the specialists in Patagonia, Rolando Garibotti himself says of this ascent and descent out of norm : « we will talk about it for a long time, a very long time« . Would we be dealing with a new generation of climbers ? Exclusive interview with Jim Reynolds. What do you want to say first about that solo ascent ? This is what I am compelled to do from the deepest part of who I am. I don’t take my solos lightly and while they are very important experiences, I love life and intend to keep living as long as I can. I think that we as climbers are striving for the most beautiful expressions of our humanity in interaction with the natural world as we can imagine. It is the responsibility of each of us to push for the things that are most beautiful, even if they seem impossible. Climbing is an art and we should all strive to do it in the best style we can imagine for ourselves. If we cannot create art ourselves, we should do our best to enable others to do so. I also respect that my life is worth much more that impressive free solo ascents. I’ve seen what happens to a person when they fall 3000 feet to the ground. I climb with respect to these images and 2nd hand experiences of death that have become a part of me. I am not an adrenaline junkie or someone who disregards the value of life, but I do believe that love is greater than fear, even the fear of death. Are you used to climb solo ? I have done a lot of free solo climbing in Yosemite and occassionally elsewhere. I have never soloed above 5.11 and try to keep things in the 5.10 or under range. My biggest day of soloing was to climb Galactic Hitchhiker on Glacier point 5.10 A0 20 pitches, Steck-Salathe on Sentinel 5.9 15 pitches, the East Buttress of Middle Cathedral 5.10 10pitches, North East Buttress on Higher Cathedral 5.9 12 pitches, then down the Braille Book on Higher 5.8 5 pitches. I have soloed many other routes there (not Astroman or Rostrum) and have also been into speed climbing, with the Nose record at 2:19:44, and link up of Nose, Half dome and Watkins in 18.5hrs. It was your first trip to Patagonia. Did you plan big performances ? Have you prepared these solos, with Fitz Roy as cherry on the cake ? I didn’t think I would solo anything in Patagonia, until about a week before I did. I did it because I realized that it made sense for me and who I am as a climber. Raf and Exupery were great training for the Affanaseif, but I did them because they were inspiring and amazing, not because I had something bigger in mind. You did not have a helmet, no topo, no harness, but a rope ! Is there a little offhand ? I didn’t take the ascent lightly. For me personally I want very conscientious about planning and preparing physically, mentally, and spiritually. I forgot these things because I didn’t need them, they weren’t important. When I discovered I hadn’t brought them it did little to dissuade me from my objective. I am not proud of forgetting these things. I am young and a relatively inexperience alpine climber and I am quite embarrassed whenever I leave something behind, so I am trying to learn and get more dialed all the time. Like I said though, if they were critical to the plan (or even the backup plan) I doubt I would have forgotten them. I still had enough gear to rappel if necessary, and plenty of beta to navigate safely up and down. Are you a fervent disciple of Paul Preuss, to not use the rope on the way down ? I hadn’t heard of Paul Preuss until after the climbs. I was doing what seemed like the best style for me. I’ve always liked downclimbing and thought that it was a great option for me. It was my first time climbing Fitz Roy and so I don’t know any of the other descents and rappelling the Affanaseif would be a nightmare. I thought I might rappel a pitch here or there if it made sense, but I think downclimbing is a highly effective technique in the mountains when you are solo. I’m not claiming to be an expert « alpine » climber, and respect that I have a lot to learn, but I am a very thoughtful and intentional climber. No doubt, when you receive media attention, you aren’t going to like it all. I hope that your magazine isn’t the one that portrays me as a fool, and warps the values and messages that I think are really important. A few days before, you tried the Fitz Roy solo but you turned around. How do you know if it’s the right time or the wrong time ? I decided to turn around for several reasons, but none of them are very tangible. I was tired as my solos in the Torre Valley were only a few days before. Mostly though I turned around because I wasn’t enjoying it. Granted, not all parts are going to be « fun, » but I don’t want to slog to the top of one of the most beautiful mountains in the world. Its not just about the summit (part of the reason why I chose the Affanaseif, its a natural and beautiful line) and I found myself just trying to get up. I thought the mountain deserved more respect than being climbed by the tired, half-psyched version of myself. I also didn’t want the summit enough; later I realized that you do have to want the summit on a big mountain, otherwise you aren’t going to get there. How did you prepare yourself, physically and mentally ? Its a life of preparation you know. I chose to do it because I was prepared, not the other way around. Then comes learning the route and trying to figure out just how much risk I am assuming and whether my dream of climbing the route is similar to the reality of what it will be. Its hard to know when you are onsighting in the mountains, and I did need a slightly different mentality from the first attempt and the second. I thought that it would be similar to climbing Chiaro di Luna, but it wasn’t. They are completely different kind of routes. How did you manage with ice fallings on the upper part of the climb ? I managed it by climbing quickly between section of exposure, and taking time and planning in safe zones. I adapted my route to avoid features that were funneling ice fall including several sections of face climbing closer or staying closer to ridges. I didn’t bring a helmet because I knew there would be no climbers above me and I would never be exposing myself to falling rock by pulling ropes while rappelling. The amount of falling ice was unexpected, just as the amount of sun that was melting that ice was also unexpected. The forecast called for a shadier and cooler day than it ended up being. Bringing a helmet would have made me more comfortable in that section, but maybe less comfortable in other spots. We can never predict everything that will happen I suppose. How do you look back your ascent ? I see so many impressive climbers doing so many impressive climbs around the world. People who put massive amounts of time and dedication into their projects. I too have put in a lot of time and dedication, but my ascent doesn’t make me feel like I am better than others. I just did a good job of finding an objective that suited my very specific strengths. It happened to be something that hadn’t ever been done on a mountain that is famous across the world. Personally, I appreciate that it gives me the chance to convey values that I think are important. That climbing (even solo) is something that is done with the whole community. Our goal should be to create experiences that fill us with such joy that we have extra to share with the whole world. It is an attempt to create art through the combining of the most impressive expressions of power in the natural world with the richest parts of our humanity. with the richest parts of our humanity. What doing after such an ascent on the Fitz Roy ? I’m really excited to free El Cap, tick a couple of boulder problems (Midnight Lightning) that inspire me and continue to apply myself to beautiful things when it seems right. Maybe no one else will care, but I will. I’m not trying to chase glory. This ascent doesn’t need anything to top it. Someone else can do it barefoot and chalkless if that’s what gets them psyched. Aside from that I recognize that not all the great mountains of the world are made of rock and snow, and I hope to continue to live a life that positively impacts those around me, through my work on Search and Rescue and through other journeys moving forward. We can not talk about solo without thinking about Alex Honnold right now. What do you want to tell him ? High five ! My ascent does nothing to diminish what Alex has done. His Freerider project took years (possibly a life) of dedication and is still one of the most impressive human feats ever accomplished. I think we’d enjoy talking about our separate experiences in the mountains of the Fitz Massif.